Anchor Bay Entertainment recently send us information for their upcoming DVD & Blu-Ray release of "The Drownsman". The film has played at many horror film festivals including Fantasia Film Festival, Toronto After Dark, Buffalo Dreams Fantastic Film Festival and Buenos Aires Rojo Sangre Film Festival. 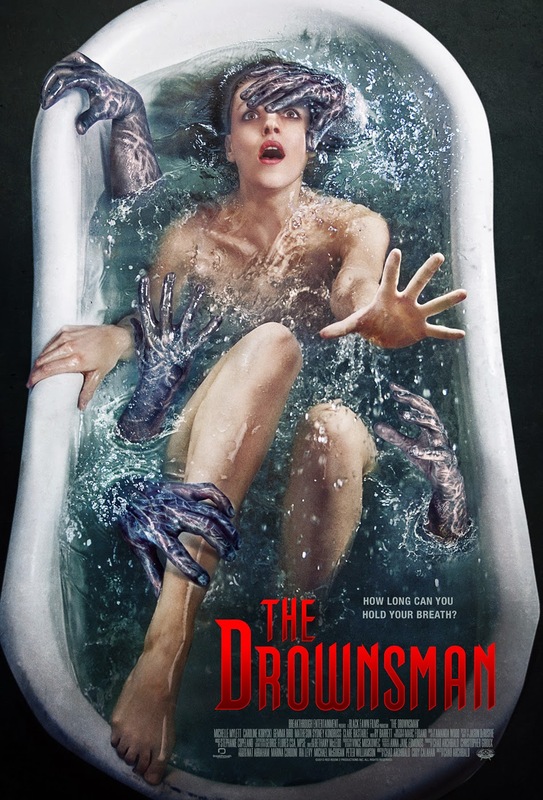 "The Drownsman" is directed by the co-screenwriter of "Antisocial" Chad Archibald and stars Michelle Mylett (Antisocial), Caroline Korycki, Gemma Bird Matheson, Sydney Kondruss, Clare Bastable and in the horrifying title role, Ry Barrett (Neverlost, Kingdom Come, If A Tree Falls). "The Drownsman" hits retail on May 12th. Can a glass of water kill? When you see a puddle on the floor, do you fear you’ll fall into it? What if the stuff of life was a gateway into your worst dreams? On May 12th, Anchor Bay Entertainment presents the provocative and highly anticipated Canadian horror film The Drownsman on Blu-ray™ and DVD. SRP is $26.99 for the Blu-ray™ and $22.98 for the DVD, with pre-book on April 8th. After almost drowning in a lake accident, Madison (Michelle Mylett, Antisocial) develops hydrophobia: an abnormal fear of water. After shutting the world and her friends out for over a year, her friends attempt an intervention. But, instead of curbing Madison’s fear, they unknowingly unleash something far worse: The vision of serial killer – turned- supernatural psychopath Sebastian Donner – known as “The Drownsman” – who begins to stalk the women one by one, dragging them into a lair of submerged torment from which there is no escape. The Drownsman has captivated audiences at film festivals all over the world, including Fantasia Film Festival, Toronto After Dark, Buffalo Dreams Fantastic Film Festival and Buenos Aires Rojo Sangre Film Festival. Accolades include winning Best Horror Feature at Buffalo Dreams and Best Feature at Buenos Aires RSFF. The Drownsman was directed by Chad Archibald (Neverlost, Ejecta), written by Cody Calahan (Antisocial) and Chad Archibald, produced by Christopher Giroux (Dead All Night) and stars Michelle Mylett, Caroline Korycki, Gemma Bird Matheson, Sydney Kondruss, Clare Bastable and in the horrifying title role, Ry Barrett (Neverlost, Kingdom Come, If A Tree Falls).